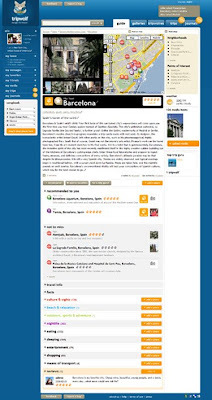 Tripwolf is a new travel based social network backed by MairDumont (Europe's biggest travel guide publisher.) 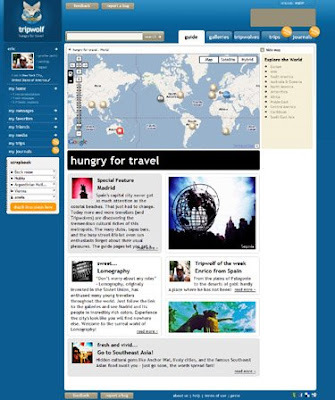 Located at http://www.tripwolf.co.uk, Tripwolf uses a Firefoxesque logo and aims to be "a social travel guide that combines professional content with user generated content." Tripwolf has a range of innovative features, including letting users sign into Tripwolf using their Facebook logins and allowing Tripwolf users to import their Facebook profile and social graph. iPhone is important in this sector and Tripwolf will shortly be releasing an iPhone optimised version of the site, whilst Schmap Travel Guides are already live with their iPhone Guides. In February Schmap featured one of my photos in their Schmap guide to Gothenburg after picking it up from my Flickr profile. 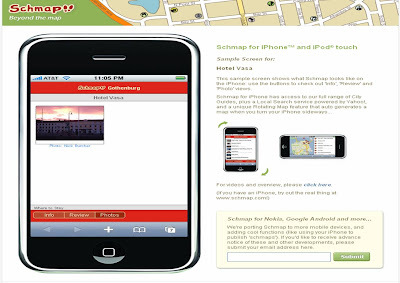 Emma from Schmap has emailed me to tell me that Schmap Guides are now available on iPhone and Emma sent me a mock up to show me how my photo looks in the iPhone version of the Schmap guide to Gothenburg. For a growing number of people, the ability to have travel information or a travel guidebook on a handheld device is preferable to carrying round a traditional guidebook. Furthermore, digital guides can offer more than a traditional travel guide as information can be dynamic, completely up to date and offer the ability to interact with friends / connections in real time. As iPhone (and other next generation mobile devices) become more ubiquitous, travel related mobile offerings will continue to develop and drive innovation across the travel sector. I believe that online travel sites will evolve significantly over the next 12 months and new launches, site overhauls, mobile integration with GPS and brand extensions will be prominent as the capabilities of the mobile internet start to be properly realised.